Many people don’t really think about Canadian food. If you’re from the United States or other parts of the world, you may think that Canadian food is very similar to American food with very little in the way of distinction. While that might be true to some extent, Canada does have its own food culture that varies widely by region, and some of the most popular dishes and foods that Canadians claim as their own might surprise you. When you visit Niagara Falls you’ll have the chance to eat a number of different cuisines from around the world, as Niagara’s restaurants try to appeal to everyone’s particular appetite or palate. However, if you want to try some of the things that Canadians love, many of Niagara’s eateries will be able to fit the bill. Whether it’s breakfast, lunch, dinner, or snacks, these are just a few of the foods you should try on your next visit to Niagara Falls. To clear up any confusion, Canadians are not like the British, in that chips are chips and fries are fries, just as they are in America. Also like America, Canadians enjoy flavored chips in addition to the simple salted potato chips. However, one of the most popular flavors of potato chips in Canada might surprise you. Ketchup chips are so popular in Canada that many Canadians living abroad ask friends and family to send them through the mail. Ketchup chips are a bit sweet, a bit sour, and taste very much like ketchup and they’re really good, You can find them everywhere, so if you’re craving a snack pick up a bag and give them a try. 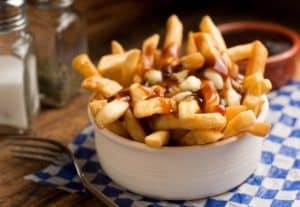 Poutine might be the most recognizable of the Canadian specialties, but many people still might not be entirely sure what it is. While there are many variations of the original dish, poutine is basically french fries topped with cheese curds and gravy. Cheese curds differ slightly from the cheeses you might be used to, as they’re more firm and slightly rubbery, and tend to squeak when bitten. The typical gravy used for poutine is a combination of beef and chicken stock. You might also find bacon, onions, or other toppings used, but the simple combination of the curds, fries, and gravy is the classic poutine that you absolutely must try at least once during your visit to Niagara. Originating from British Columbia but popular across the country, nanaimo bars might be every Canadian’s favorite dessert. The no-bake delights consist of a crunchy graham cracker or nut crust topped with a layer of custard, then topped again with a layer of chocolate. 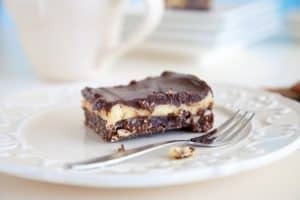 This is the basic recipe for nanaimo bars, but, of course, people often add extra ingredients and flavors to enhance what is already the perfect sweet treat. Expect to find nanaimo bars in just about every bakery and on every restaurant’s dessert menu and don’t pass up on your chance to try these tasty treats. And because they’re so easy to make you may find yourself preparing them when you get home. Niagara offers so much diversity in its food culture but you should absolutely try one of these dishes when you make your next visit to the area. And make room in your suitcase for ketchup chips.